Using hand-made tools made from insect claws and human eyelashes, Wigan slows down his breathing and heart-rate to make his miniscule figures. But though his art is tiny, the price tags are huge. He’s working on a £150,000 watch and a million pound painting, and his sculptures command upwards of £40,000 each. Can you explain a little bit about who you are, and what you do? My name is Willard Wigan, and I create the smallest sculptures in history. By hand. How did you get into such an extraordinary profession? What was your inspiration? So my journey began. I learned then, with my mother telling me to make things smaller and smaller, what to do. If I was breaking pencils in half, and my mother said I was good at breaking pencils in half, I’d practice and be the greatest pencil breaker of all time. That’s how an autistic mind works. You never stop. I had Asperger’s, which wasn’t diagnosed until later in life, but I knew I was different. I had the best thing ‘wrong’ with me in the world, because I could use what they said was ‘wrong’ with me and make something incredibly right. So I came to inhabit this microscopic world. I came from that nothingness. I used to get toothpicks and carve Beatrix Potter characters at school, and all the kids used to crowd round. I’d say “If you give me tuppence, you can see it.” So they’d give me tuppence, and have a look, and all the kids were blown away. Groups of kids would gather round to look at this tiny little thing. So I started to realise there was really something in what my mum was saying. 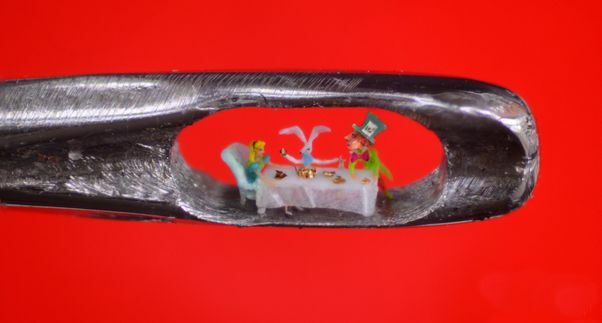 You’ve just made the world’s smallest sculpture – what can you tell us about it? It was all made by hand, no machine involved. I pulled a piece of fibre out of the carpet, and I looked at it, and put it beneath the microscope, and I carved the top of the fibre. My mum died 23 years ago, but I remembered her telling me the smaller my work, the bigger my name. So I said “Okay mum, I already broke one record, so now I’m going to do another one. But I’m going to smash anything to pieces right now. I decided to make it about “The Beginning” – where we begin life, as an embryo. So I decided to do a foetus. I got a pearl drill and sharpened the end of it with a little jeweller’s dremel, and a very fine diamond disc, and a rubber disc, which sharpened the point. And then I got another tool, which is like an acupuncture needle, which is sharpened into a little claw, to hold the material down. Then I decided to cut away very gently, until I could see the shape of the baby’s head. Then I had to carve the legs and the arms. And I could see the shape coming. But each time I’m cutting away I have to work between my heartbeats. This was extreme, I had to hold my breath a little bit longer, I had to wait, squeeze my fingers, control the muscles in my fingers, the joints – the dexterity had to be a little more extreme. So I was a dead man working – everything has to be rigid, there can be no noise. The journey drives me mad, I’m not happy with it, but I’m happy with the end result. You’ve been filmed by Channel 4 for a new documentary – what’s it all about? It’s about me, and my life, and me creating things that people can’t see. The documentary itself is an education. It shows that you should never underestimate something that’s small. Just because you can’t see something doesn’t mean it’s not there. And when you see what is there, it becomes almost miraculous. Why did you decide to take part? Because I wanted to get people to understand that there are people out there with learning differences who have extreme, miraculous and inexplicable gifts. Not just me. I’m doing it for them, so that people don’t underestimate them. Put these kids under the microscope and you’ll see something amazing. Let them find what they’re good at. Not everyone’s the same. How long did it take you to make The Beginning? Three weeks of going mad. It’s so frustrating. Any microscopic movements can be detrimental to what I’m doing. So I have to train myself not to do it. I’ve been training myself for 55 years. I’m now 60 years old. So do you feel like you’re getting better at your work? Oh yeah, I’m getting better. The world hasn’t seen Willard Wigan yet. They’re going to see a lot more. My mum used to say “Be the Muhammed Ali of microscopic work.” I used to see him on TV going “I am the greatest,” and I thought “Yeah, I’m going to become that.” He’s someone who has really inspired me. I love artists like Michelangelo, Salvador Dali, Henry Moore. I look up to greatness. It doesn’t matter if it’s art or tennis or football, I like seeing greatness. And I hope that I’m an inspiration to other kids who have autism. Not just people with autism, anyone with low self-esteem. I’m here to deliver the smallest, biggest message in the world. Do you ever get defeated by a project, and give up on it, deciding you simply can’t do it? One time I was doing the whole of Swan Lake on a floating fibre, and it floated away. And you’ve accidentally inhaled some of your work? Oh yeah, I’ve inhaled some of my work. One piece I was working on was the Alice in Wonderland story. I’d got the Mad Hatter, the teapot, the Hare, the Dormouse, and the Rabbit, so Alice was last. And I got the shape of her, and painted her with an eyelash, and then I went to put her behind a chair, and my mobile phone went off. And you know when your mobile phone goes off when you don’t want it to, the first thing you do is inhale. And there was no more Alice. It’s hugely skilled work, almost unimaginably so – but do you get people who claim it isn’t art, that it’s more science than art? It’s art with mixed science. Art is in the eye of the beholder. Every time I have an exhibition, people are blown away. It’s art in its own way. Is it true that the Queen has one of your pieces? Yeah. I’ve got two letters from the queen, saying how delighted she is with it, and how amazing my work is. She couldn’t believe what she saw. When I did an exhibition at the Chelsea Flower Show, Princess Anne said she’d come especially to see me. Andrew, Beatrice and Eugenie all came and looked at the work, and said it was unbelievable. I think that was the Mount Everest of my career, delivering my work to the Queen. It’s a crown on the head of a pin. Is that the piece of work that you’re most proud of? Yes. It’s not the hardest though. The Last Supper was the one that took the longest, but the hardest was Prince Albert on a Horse. That one took me four weeks of going mad. I can’t explain. Trying to make that man, and the symmetrical shape of the horse… trying to cut out the shape and get the dimensions right – and the horse is smaller than a full stop. So I’ve got to get all the detail right, the stirrups, the reins, the uniform, the sword, the medals – the medals are smaller than blood cells. So that’s the hardest thing I’ve ever done. You have a history of making your tools from bizarre things – what’s the strangest? I found a dead aphid fly, and took the antennas off it and made a paintbrush. I used the claw of an aphid fly to move things. They’re all dead – I’d never kill an insect – they have every right to be here. World’s Tiniest Masterpieces is on Channel 4 on Sunday 8th July at 10:10pm.